High-strength or heat-treated fasteners are often required to handle the tensile, shear or combination loads on the bolted joints in demanding applications. Many demanding applications require high-strength fasteners in order to handle high tensile and shear stresses generated by the applied loads on the bolted or fastened joint. 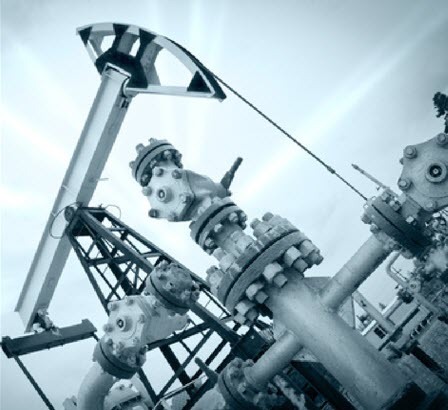 Oil and gas, petrochemical, chemical and power generation plants contain boilers, pressure piping vessels, valves and process equipment requiring high-strength bolting to maintain seal closure on flanged joints, fittings and closures. Heat-treated bolts are needed to withstand the tensile stresses within the bolts. High horsepower industrial mixers and pump drive shafts often require the higher shear strength provided by heat-treated bolts or pins. Building and construction anchor bolts such as J-bolts, L-bolts or drop-in wedge anchors, attach equipment or structural members to concrete pads or foundations. Structural anchor bolts are made of carbon or fully heat-treated medium alloy steel. Slip-critical or friction-type joints rely on the clamping force of the bolts developed by press stressing. Bolting of structural components in a construction project requires ASTM A325 or ASTM A490 fasteners in heavily loaded structures, such as buildings with high-strength steel members. 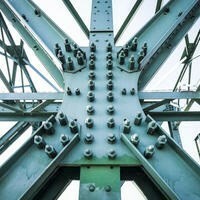 Lower strength, mild carbon steel structural bolts, per ASTM A307, can be used to fasten statically loaded structures with lightweight members. Heat-treated fasteners are also essential in engine, vehicle and hydraulic applications where bolts and fasteners are under high stresses. For instance, high-strength head, block and another bolting on large diesel marine and truck engines are highly torqued or pre-stressed to keep the gaskets sealed. High pressure and four bolt hydraulic flange connections (SAE J518) are held together using hardened bolts. Four bolt connections are found on hydraulic systems in aircraft, offshore oil rigs, heavy lift vessels, railroad cars, industrial presses and molding machines. Fully heat-treated U-bolts can be found in heavy-duty off-road vehicles, mining trucks and forestry trailers to attach leaf springs or other components. Mechanical loads and stresses are one aspect of fastener selection. Environmental considerations such as temperature and corrosive media are an additional factor that will impact a project. Highly corrosive environments with low stresses might require stainless steel fasteners. Structures exposed to low temperatures might require ASTM A320 bolts. ASTM A193 provides specifications for alloy and stainless steel bolts for high-temperature service. About 90 percent of fasteners are steel based and the required strength level is usually developed in steel fasteners using quenching and tempering processes. Accordingly, the terms “high strength” with “heat treated” or “hardened” are often equivocated with the fastener world. However, heat treatment includes a wide range of processes. Some heat treatments like annealing soften a metal, while others harden and strengthen. Annealing heat treatments are used to relieve residual stress, remove cold work and dissolve the alloying element or segregation and provide a more homogeneous material. Higher carbon steels can be hardened, while low carbon steels are considered non-hardenable. The steel in low-strength ASTM A307 or SAE Grade 2 fasteners is a low carbon grade, such as AISI 1018 or 1020. Grade 304 or 316 austenitic stainless steel fasteners contain little carbon and therefore cannot be hardened by heat treatment. Certain martensitic stainless grades, such as ASTM A193 grades B6 and B5, can be hardened through a quench and temper heat treatment. Grades B5 and B6 are used in high-temperature and high-pressure service and special purpose applications. Heat treatments of stainless bolts are employed to dissolve coarse chromium carbide particles, which may reduce corrosion resistance and toughness. The carbide solution treatment of stainless steel fasteners can improve cryogenic or low temperature toughness and is part of the ASTM A320 specification. ASTM A325, ASTM A490 SAE grade 5 and SAE grade 8 fasteners are made of higher carbon plain or alloy steels, which can be hardened through a quenching and tempering process. Heat treated SAE grade 8 bolts have twice the minimum tensile strength of SAE grade 2 bolts. In the quench and temper hardening process, steel fasteners are first heated up to a temperature where their structure is converted into austenite and then quenched or rapidly cooled in water, oil or air to crystal structures that transform to martensite. Next, the martensitic steel fasteners are heated at an intermediate tempering temperature to change the martensite to ferrite, with a very fine dispersion of cementite. Steels cooled slowly from austenitizing temperatures, as well as nonhardenable, low carbon grade steels, form a softer, coarser pearlite structure of ferrite and iron carbides (cementite). 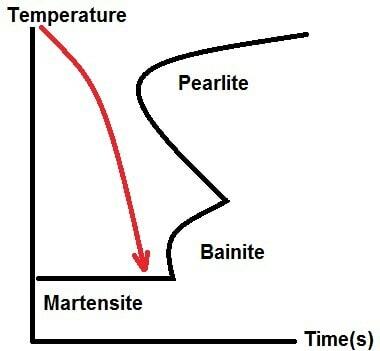 The cooling rate has to be fast enough to avoid the formation of pearlite. Even among hardenable steels, the degree of hardenability varies with level of carbon and alloying elements like chromium, molybdenum, manganese, silicon, vanadium and nickel, which retard ferrite formation and shift the nose of pearlite to start formation of the curve to the right (Figure 4). The hardenability impacts how deeply into the material the hardness changes will occur during the heat treatment process. Steel alloys with higher carbon and alloying elements can be through hardened and transformations will occur throughout the part even at lower cooling rates, which reduces residual stress and distortion during heat treatment. In lower hardenability alloys, hardening will only occur part way into the alloy from the surface. The carburized steel pin or fastener is then conventionally hardened with a quench and temper process. The resulting fastener has a soft, tough, low carbon steel inner core with a case-hardened, high carbon steel outer surface. The hardened surface resists abrasion, wear or cutting. T;he soft, tough inner core prevents fasteners from being snapped or sheared. Pins and sheet metal screws often use case-hardened surfaces. Bolts, shackles and other hardware for locks are often case hardened because they are not easily saw cut and have the toughness to resist fracture from a hammer blow. While high-strength steel fasteners are a critical element and an enabler in many advanced structure and high tech mechanical designs, care needs to be taken in using hardened steel fasteners. High-strength fasteners with a Rockwell C hardness above 35 are susceptible to hydrogen embrittlement. Hydrogen embrittlement causes a loss or partial loss of ductility in hardened steel, which can result in sudden, catastrophic and premature failures of the fastener in the field. Exposure to hydrogen during processing or in the field application should be avoided. Atomic hydrogen can be absorbed into steel fasteners during phosphating, pickling (acid cleaning or descaling), plating and electrogalvanizing processes. While alternate protective coatings are recommended, a hydrogen bake heat treatment can be used to remove residual hydrogen after plating or electrochemical processes. The ASTM F1941 Standard Specification for Electrodeposited Coatings on Mechanical Fasteners, Inch and Metric, requires a hydrogen bake. The hydrogen bake should be done a few hours after plating, usually at 350° to 450° F for two to 24 hours. Environmental exposure to sour gas (hydrogen) sulfide, galvanic corrosion conditions and even high-pressure steam in the field can cause “external or environmental hydrogen embrittlement.” Minimizing the initial amount of hydrogen in steel can help avoid these problems. Galvanic corrosion due to impressed currents or dissimilar material couples (e.g., steel used to bolt aluminum or copper/brass alloys) can be avoided by isolating the fasteners with non-conductive washers or sleeves, or by selecting compatible materials. Overheating during processing (high-temperature galvanizing baths), installation (tack welding, brazing) and the field application (reactor, furnace, etc. ), can lead to annealing or softening of a hardened fastener if the temperature and time at temperature is excessive. ASTM F2329 requires testing for mechanical properties if the galvanizing process occurs at temperatures exceeding the tempering temperature of the steel alloy. 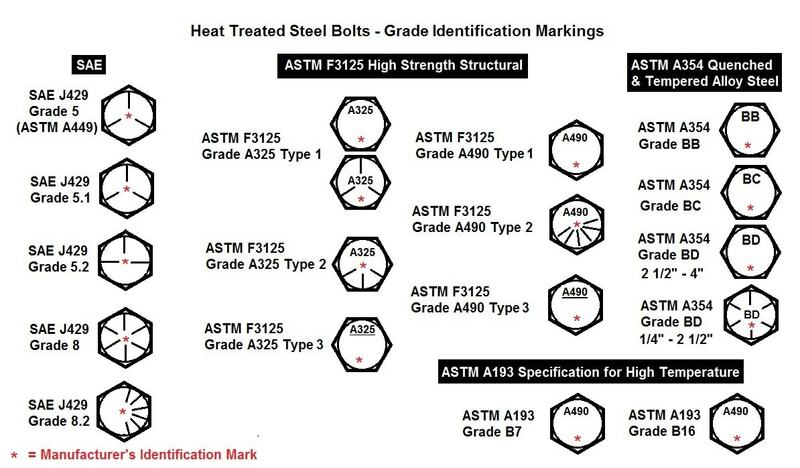 A well-known example of how temperature impacts bolt strength is the comparison between low carbon boron steel SAE J429 grade 8.2 bolts to medium carbon alloy steel grade 8 bolts. Both grades have similar properties when tested at room temperature. The lower tempering temperature (650° F) of boron steel prohibits the use of grade 8.2 bolts at higher temperatures. Grade 8 alloy steel bolts have a tempering temperature of 800° F, which allows their use at higher temperatures. Heat-treated bolts are stronger, but not indestructible. Misuse of fasteners could lead to their breakage and even failure of the entire assembly, equipment or structure. Over-tightening hardened bolts above their torsional strength can result in failure. Under-tightened fasteners can lead to premature failure due to fretting, fretting fatigue or changes in loading and internal stresses on the fasteners. As with any threaded fastening system, the proper torque level must be applied to take full advantage of the bolt’s strength levels. If a soft, nonheat treated nut is used with a hardened bolt, then premature failure is likely to occur in the nut. In bolting applications, ASTM A563 or ASTM A194 grade heavy-duty nuts should be used with strength levels comparable to or compatible with the high-strength bolts selected (Figure 5). Heat-treated bolts are not designed for use in threaded holes because steel plates or structural members are usually soft carbon steel or unhardened alloy steel. In threaded stud applications, the material with the threaded hole should have strength levels compatible with the heat-treated fastener. Washers should meet ASTM F436 specifications for hardened steel washers as well. 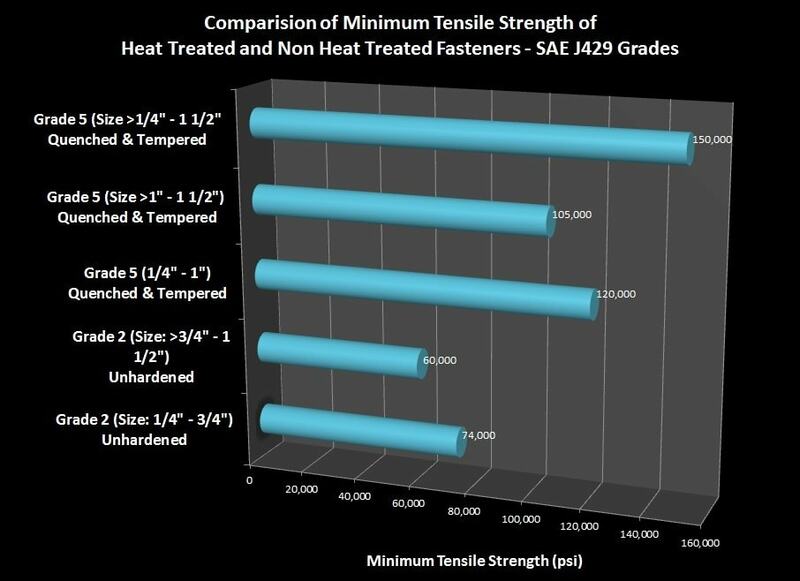 Utilizing heat-treated fasteners in a design can provide structural benefits. However, heat treated bolts will have higher costs compared to unhardened, low carbon steel bolts. Equipment failure is a strong possibility if heat-treated or high-strength bolts are replaced with softer bolts during an overhaul, retrofit or upgrade operation. In MRO applications, the markings on the bolts should be noted when replacing worn, damaged or rusted bolts. If the bolt head is rusted or damaged to the point where the markings are unreadable, the equipment manual or OEM should be consulted for the proper fastener specifications. If the bolts were at the point of failure in the repair project, then consulting the equipment manual, construction specifications or OEM for the correct bolt grades would be a good idea. If no markings are visible, manuals are lost and the manufacturer is unknown or closed, then as a last resort, hardness testing of the bolt might indicate if the fasteners being replaced were heat treated. Additional information is available on Bayou City Bolt’s website. Bayou City Bolt and Supply can find heat-treated fastener materials meeting the demands of the most strenuous applications.